Recently, I went on a potato stamping bender. 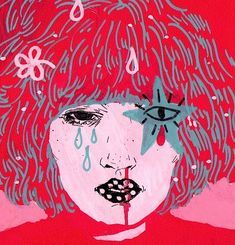 I know some people go nuts with illicit drugs; I go crazy with an economy-size sack of spuds and neon craft paint. We all have our own vices … but I digress. 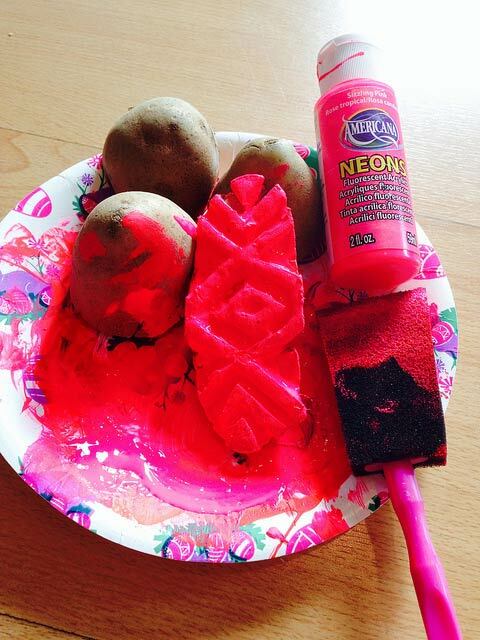 I had always thought of potato stamping as a craft for kids, something my daughter would bring home from preschool. Once I got the hang of things, I realized potato stamps have all kinds of fun potential. Lemme tell you what I learned. I have tried rubber stamp carving, and it was hard. Carving on a potato was easy and forgiving—not to mention a lot cheaper. 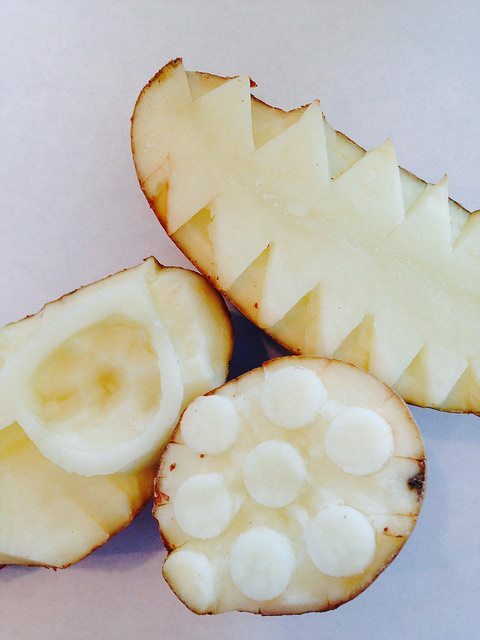 If you mess up your potato, you can just cut a cross-section off and start again. A bag of potatoes is three bucks, and you already have knives. A Speedball rubber block and carving tools is a chunk out of a paycheck. If you have stamp carving tools, by all means give them a shot on the spud. However, I found that a carving knife, cookie cutter, and dried-out ballpoint pen worked great. 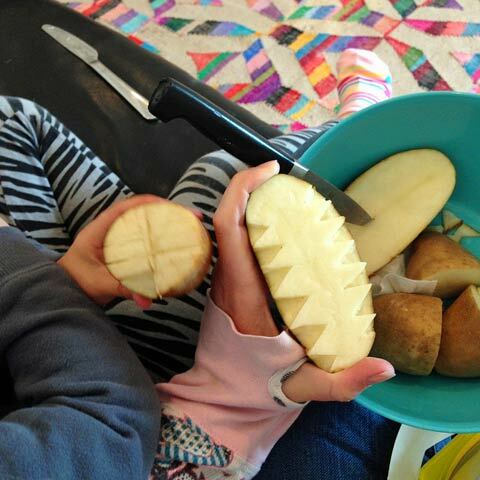 Cut your potato in half, decide on a design, and get carving. The thing to remember is what you cut out will not stamp. What you leave is what will stamp. You have to think in reverse, so to speak. I found myself carving chevrons (yeah, I know I said they were passé), hipster glasses, polka dots, teeth and tribal prints. If you don’t feel brave enough to freehand something, think about using small stencils or even cookie cutters. You can use a myriad of different paints on your potato stamp. 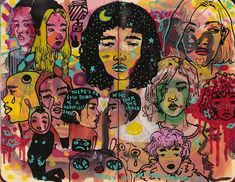 I used both craft paint and fabric paint. Both worked beautifully. I was hoping that all my colored ink pads would also be an option—but alas, no. 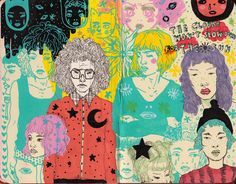 I’m still wondering if I could stamp with glue and sprinkle glitter on top. Whether you are using craft paint or fabric paint, applying paint to a vegetable can be tricky. Before you apply any paint, be sure to gently blot away any excess potato liquid with paper towels. 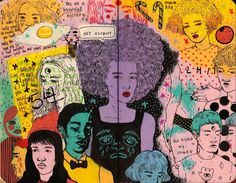 I found two methods to apply paint that worked for me. One was placing paint directly on my potato with a sponge brush. This worked much better than just plopping my potato into a plate of paint, giving it a more even coat. 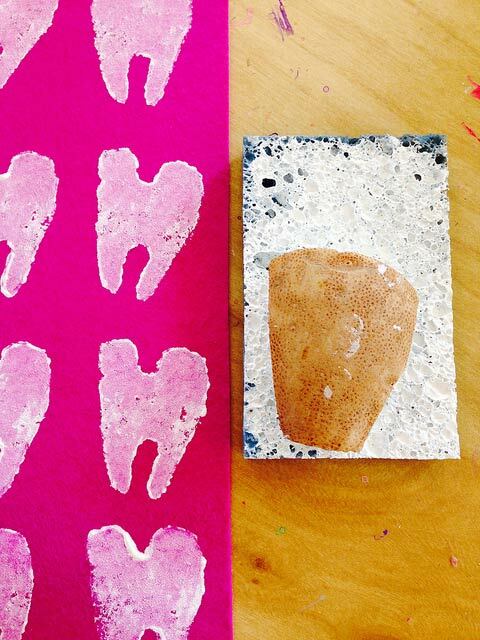 The second method is to convert a kitchen sponge into a makeshift ink pad. 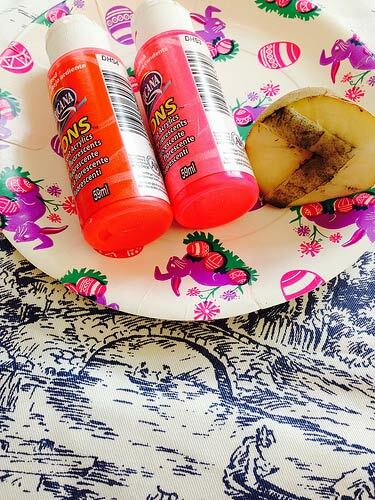 Squirt paint onto your sponge, then dab your potato on top of the sponge until it’s evenly coated. Paper is a great option, but you don’t have to use a giant piece of construction paper, kindergarten-style. Why not hand-stamp some cards? 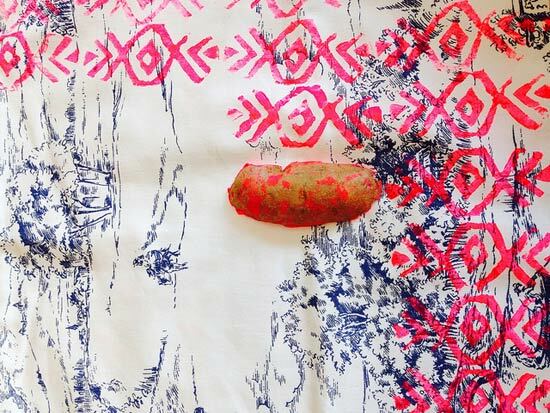 Maybe you are into art journaling—it doesn’t get much more mixed-media than throwing a potato stamp in there. Fabric also works great. 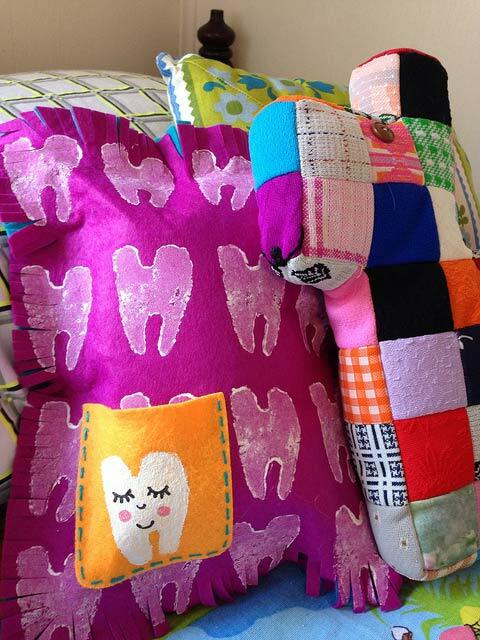 I not only made an adorable throw pillow; I also made a tooth fairy pillow for my daughter. 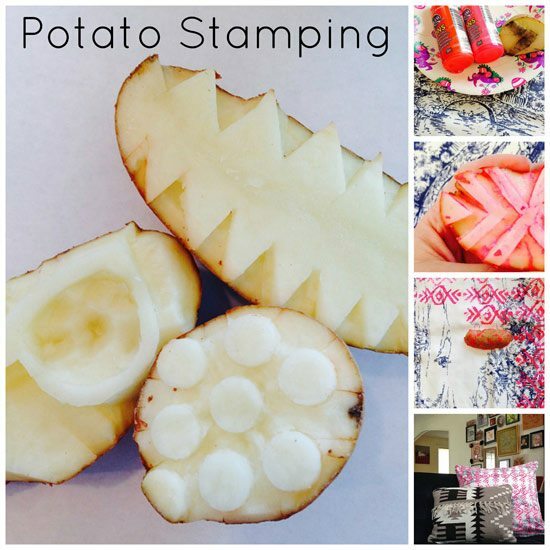 Potato stamps don’t have to be crude and basic. Sadly, your stamp will not last forever. Mine went strong for a couple of days. The stamps were almost even better the second day, since the potatoes had dried out. But note that unless you are amazing or have a very basic stamp shape, no two tater stamps are the same. Of course, the design you made is the same the next day, but the potato has started to dry out, so your effect will be slightly different. 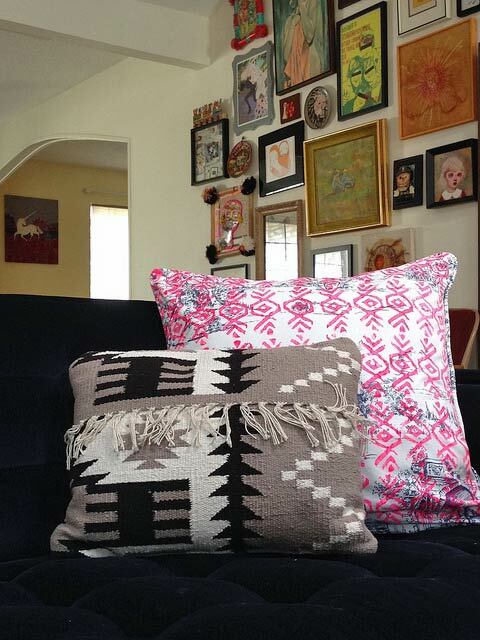 If you are making things you want to match, like, say, a pair of throw pillows, be sure to do them both on the same day. 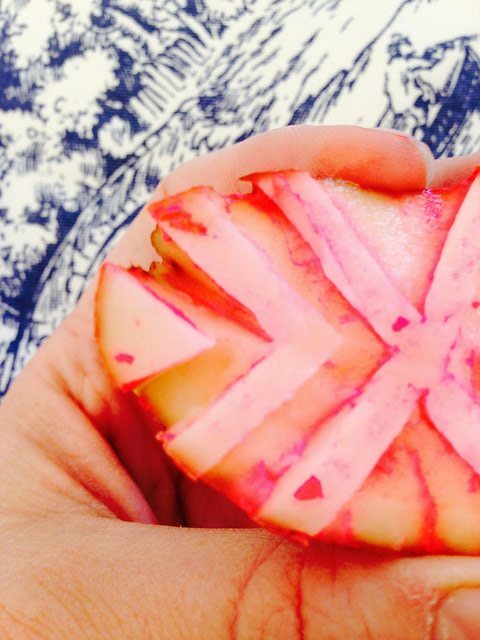 There you have it: everything you ever wanted to know about potato stamping and more. Go forth, cut spuds, and get your print on! Posted September 1, 2014 & filed under BlogHer, Crafts, Holidays, Home Décor Crafts, St. Patrick's Day. Once again, you have inspired me to be a better crafter! 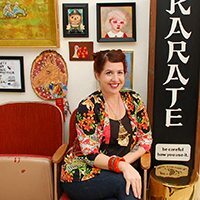 I love, love, love your projects, and I miss seeing you on TV! Thanks for sharing and I look forward to the next post!